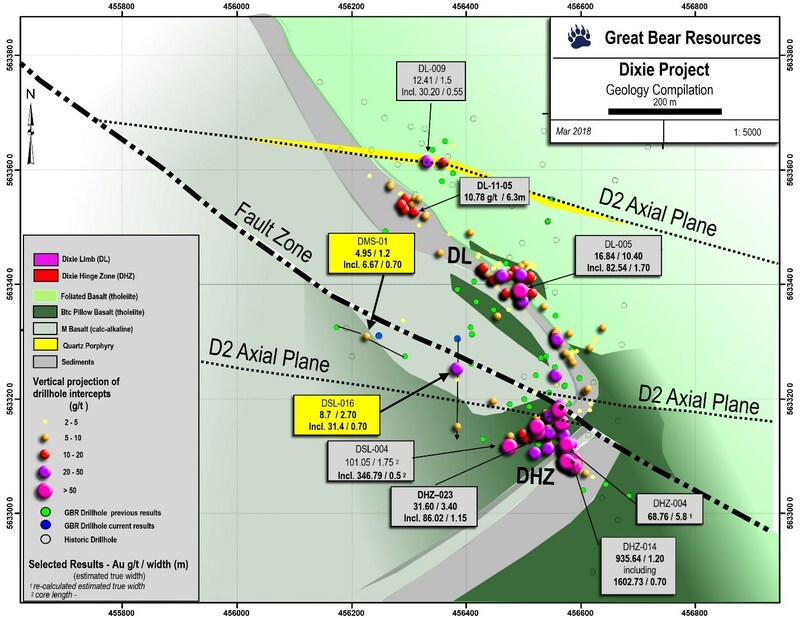 Vancouver, British Columbia--(Newsfile Corp. - March 11, 2019) - Great Bear Resources (TSXV: GBR) (the "Company" or "Great Bear"), today reported drill results from reconnaissance drilling to the west of the Dixie Hinge Zone ("DHZ") at its 100% owned Dixie Project in the Red Lake District of Ontario, and acquisition of new district properties covering additional gold mineralization targets. 31.40 g/t gold over 0.70 metres within a 2.70 metre interval of 8.70 g/t gold at only 64 metres vertical depth. An image of gold within this new high-grade intercept is provided in Figure 2. Table 1: Results of reconnaissance drilling to the west of the Hinge Zone. All widths are drill indicated core length and insufficient data exists to determine true widths and vein orientations at this time. Additional drilling has also been completed within the Hinge Zone, results of which have not been received at the time of this release. DHZ drill results will be released once assay results are received and processed. Chris Taylor, President and CEO of Great Bear said, "In a district where 25 metre step-out drilling is considered aggressive, our new reconnaissance drill holes located 150 metres and 400 metres from the Hinge Zone have yet again shown the extensive footprint of gold mineralization at Dixie, and the apparent importance of major D2 fold axes as regional gold controls. We look forward to further drilling in these areas to determine if these are separate new gold discoveries, or whether the Hinge Zone extends through this entire strike length." 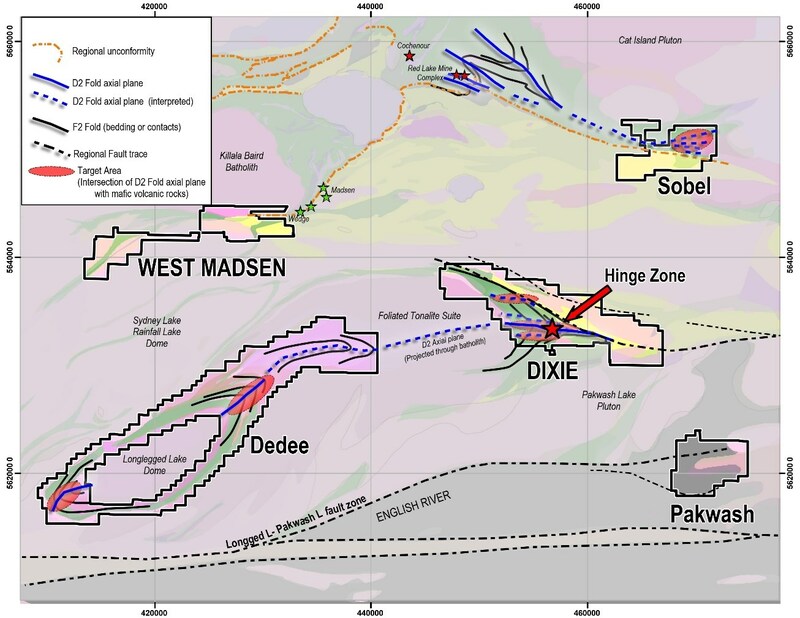 The Company notes that gold-bearing veins have now been drilled over a strike length of approximately 500 metres from the easternmost Hinge Zone drill holes to the newest drilling to the west. This veining is located on the south side of an ultramafic body and fault that are sub-parallel to the regional D2 fold axis. Figure 1: Map of reconnaissance drill holes west of the Hinge Zone, adjacent to a D2 fold axis. Drill holes DL-016, 017 and 018 are located 150 metres west of current Hinge zone drilling. Holes DMS-001 and 002 are located 400 metres west of current Hinge Zone drilling. The Company also notes that the next interpreted D2 fold axis to the north, also shown on Figure 1, also hosts high grade gold within a quartz feldspar porphyry dike, including 30.20 g/t gold over 0.55 metres, within a wider interval of 12.41 g/t gold over 1.5 metres in hole DL-009, which was drilled by the Company in late 2017. This second fold axis is also an exploration target for future step-out drilling. 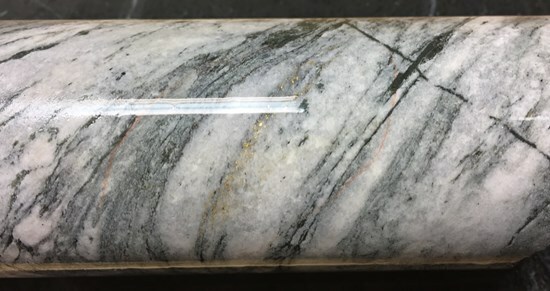 Figure 2: Image of newly discovered high-grade gold returning 31.40 g/t gold over 0.70 metres at 64 metres depth, from reconnaissance drill hole DSL-016, located west of the DHZ. Great Bear is currently undertaking a fully-funded 30,000 metre, approximately 150 drill hole program that is expected to continue through 2019. A second drill rig was added to the project in February 2019 to accelerate this work and is now drilling additional gold targets. The Company also reports new low-cost, royalty-free property acquisitions adding to its strategic land positions in the Red Lake District of Ontario. The newly acquired properties will be mapped and prospected in summer 2019, with minimal impact on the Company's current Dixie property exploration budget and program. A map of the acquired properties is provided in Figure 3. Chris Taylor continued, "Following our recent drill success at Dixie, the total staked area within the Red Lake district increased by over 150%, constituting the area's largest staking rush in decades. We have completed a model-driven geological review of the district using the Dixie property's D2 fold and deep-seated structural gold controls as guides. This work suggests additional prospective areas for gold mineralization, which we have now secured, royalty free. We intend to prospect the new properties in summer 2019." Figure 3: Map of newly acquired and optioned properties in the Red Lake district. Great Bear has not completed sufficient work on the new properties to verify results from historical work. 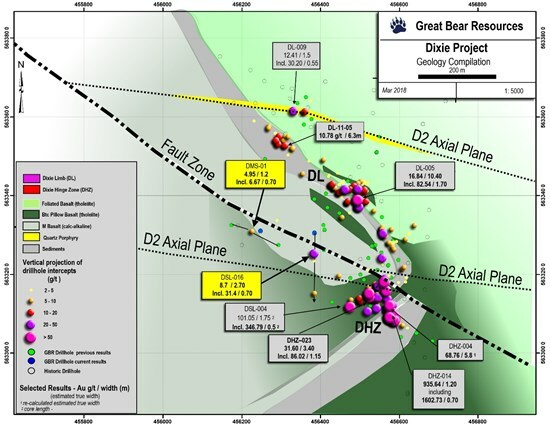 Covers the western strike extensions of the major regional D2 fold axial plane that is interpreted as a control of the new high-grade gold discoveries at Great Bear's flagship Dixie property. Two folded greenstone belts are interpreted at Dedee that mimic the geometry of the Dixie folded greenstones. Historical drill reports of sulphides similar to the Dixie Limb Zone mineralization that were never assayed for gold. 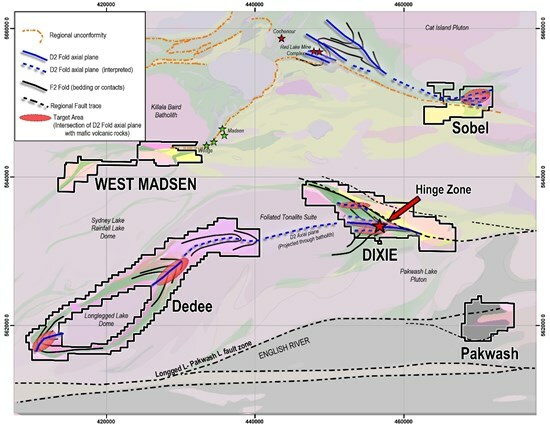 Conductive trends similar to the Dixie Limb Zone have also been identified in historic unpublished geophysical surveys; at Dixie, these led Teck Resources to the original gold discovery of the 88-4 zone and associated gold; they are also prospective targets at Dedee. (f) $24,000 on or before the date that is four years after the Effective Date. The 3,100-hectare (31 square kilometre) Pakwash property is located southeast of the Dixie property and covers portions a major regional fault structure lying along English River sediments. Historical work has identified gold lake sediment anomalies which are coincident with regional fault zones and gold-in-soil (MMI) anomalies which have not been followed up with detailed exploration. (f) $20,000 on or before the date that is four years after the Effective Date. The 3,200-hectare (32 square kilometre) Sobel property, is located along the strike extension of the main D2 fold axial plane that is a major interpreted control of gold mineralization at the Red Lake Gold Mine, operated by Goldcorp. The property overlies prospective Balmer Sequence rocks of the main Red Lake greenstone belt. (e) $20,000 on or before the date that is three years after the Effective Date. The Company has elected to buy out all the outstanding royalties on the newly optioned properties for total consideration of 38,500 shares of Great Bear. The schedule of optional payments for all of the optioned properties can be accelerated at any time at the Company's discretion in order to achieve full ownership at an earlier date. The options may also be terminated at any time subsequent to the initial cash and share payment. Great Bear's flagship Dixie property is located approximately 15 minutes' drive along Highway 105 from downtown Red Lake, Ontario. The Red Lake mining district has produced over 30,000,000 ounces of gold and is one of the premier mining districts in Canada, benefitting from major active mining operations including the Red Lake Gold Mine of Goldcorp Inc., plus modern infrastructure and a skilled workforce. The Dixie property covers a drill and geophysically defined 10-kilometre gold mineralized structure similar to that hosting other producing gold mines in the district. In addition, Great Bear is also earning a 100% royalty-free interest in the West Madsen, Pakwash, Dedee and Sobel properties, which cover regionally significant gold-controlling structures and prospective geology. All of Great Bear's Red Lake projects are accessible year-round through existing roads.